A German robot — named Cimon is a friendly guy and he has this hard power-off button. The large, round, plastic robot head is part of SpaceX’s latest supply delivery to the International Space Station. Friday’s pre-dawn liftoff also includes two sets of genetically identical female mice, 20 mouse astronauts that will pick up where NASA’s identical twin brother astronauts left off a few years ago. Super-caffeinated coffee is also flying up for the space station’s java-craving crew. As intriguing as identical space siblings and turbo-charged space coffee may be, it’s the German robot — named Cimon, pronounced Simon, after a genius doctor in science fiction’s “Captain Future” — that’s stealing the show. “He’s a friendly guy and he has this hard power-off button,” German Space Agency physicist Christian Karrasch, the project manager, told The Associated Press on Thursday. 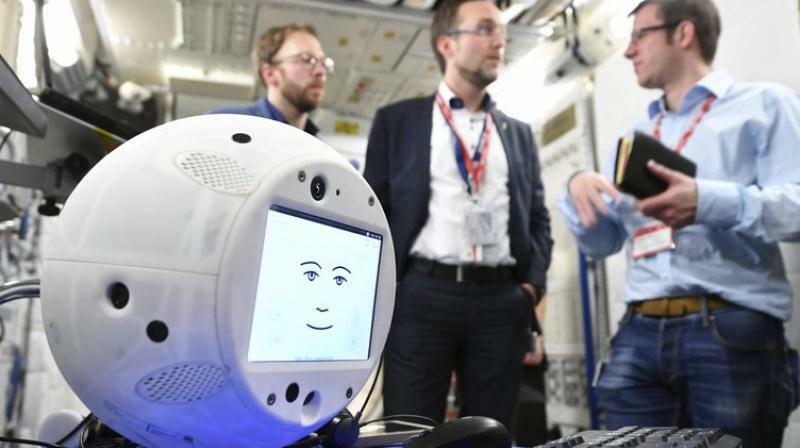 German astronaut Alexander Gerst, who arrived at the orbiting lab a month ago, will introduce Cimon to space life during three one-hour sessions. Already savvy about Gerst’s science experiments, the self-propelling Cimon will float at the astronaut’s side and help, when asked, with research procedures. Cimon has Gerst’s face and voice imprinted in its memory. So while the robot could assist the five other station astronauts, it is best suited for Gerst, according to Karrasch. To get Cimon’s attention, Gerst will need only to call its name. Their common language will be English, the official language of the space station. Next year, Italian astronaut Luca Parmitano will be Cimon’s orbital master. That’s when the AI researchers will delve more into mood. As it is, Cimon smiles when it senses the conversation is upbeat and frowns when it’s sad. A small screen on the sphere serves as its face. During its open-ended stay on the space station, Cimon should grow ever smarter and more knowledgeable, its system updated via IBM’s Cloud. Researchers chose a ball rather than a humanoid face for Cimon because they thought it would be less potentially disturbing or creepy. Because it’s perfectly round — a little bigger than a basketball — it’s also safer, with no sharp edges that could damage space station equipment or poke astronauts. The real AI payoff will be when astronauts travel to the moon, Mars or other distant destinations. In a medical emergency, no one will want to wait 20 minutes for a call for help to reach Earth and then another 20 minutes for advice to get back to the stricken crew, said NASA’s space station program manager Kirk Shireman. An AI companion could provide instant assistance. Cimon is meant for additional brainpower, so it doesn’t have legs or arms. NASA’s humanoid Robonaut, on the other hand, lacked AI but was envisioned as a Spiderman of sorts, its hands and feet designed for grabbing and climbing. Its creators saw Robonaut as a potential spacewalker, off in the future, that could venture outside for mundane tasks, saving astronauts considerable time and risk.